One week early or twelve months late… I guess it depends on your outlook really, glass half full or half empty? This is one of the many post that have stayed in draft format on this blog due to my inescapable ability to miss the tiny window tied to holiday themed posts. Work had kept me working longer hours than usual with less free time and even less of a desire to be sitting in front of a computer during said time (wait, that hasn’t changed…). Last year’s affair was rather chaotic, filled with last minute assignments, working late, edible arrangements that never arrived (or at least not on Valentine’s Day, but rather the day after), restaurant reservation that couldn’t be taken, and then calls later in the evening to confirm said reservation; the stars definitely weren’t in alignment on that one. So if you’re looking for vegan friendly chocolates to give to you sweetheart; be it for Valentine’s Day, or because you’ve been bad and don’t want to sleep in the dog house (we’ve all been there…), or just because you want to show how much you care, here is a recipe for you. Or perhaps you’re just an awesome person, and want to reward yourself with a box of homemade chocolates for snacking on in front of the TV while watching late night re-runs… in that case, can I join you? To make the peanut butter filling, in a medium bowl mix together confectioners’ sugar and peanut butter until a smooth dough has formed. The dough shouldn’t be dry, but should hold its shape when a tablespoon of dough is rolled into a ball. If the ball begins to slouch and spread add, additional confectioners’ sugar to the mix. Depending on the oil/moisture content of your peanut butter you made need to add a few more tablespoons on sugar. Roll the dough in to 16 balls using approximately 1 tablespoon of dough per ball. A small cookie scoop will help to make uniformly sized balls. Please the balls on a parchment lined cookie sheet and store in the refrigerator while preparing the chocolate. To temper the chocolate, place approximate two thirds of the chocolate into a glass or stainless steel bowl set on top of a pot of gently simmering water. Ensure that the simmering water isn’t making contact with the bowl to avoid scorching the chocolate. Gently stir until the chocolate has completely melted. Once melted, remove the pot and bowl from the heat and add the remaining chocolate. Continue to to stir until the mixture is smooth and completely melted. Using toothpicks, dip each peanut butter ball in the melted chocolate letting any excess chocolate drip back into the bowl. Return the balls to the cookie sheet and refrigerate for 10-15 minutes to allow the chocolate to set. 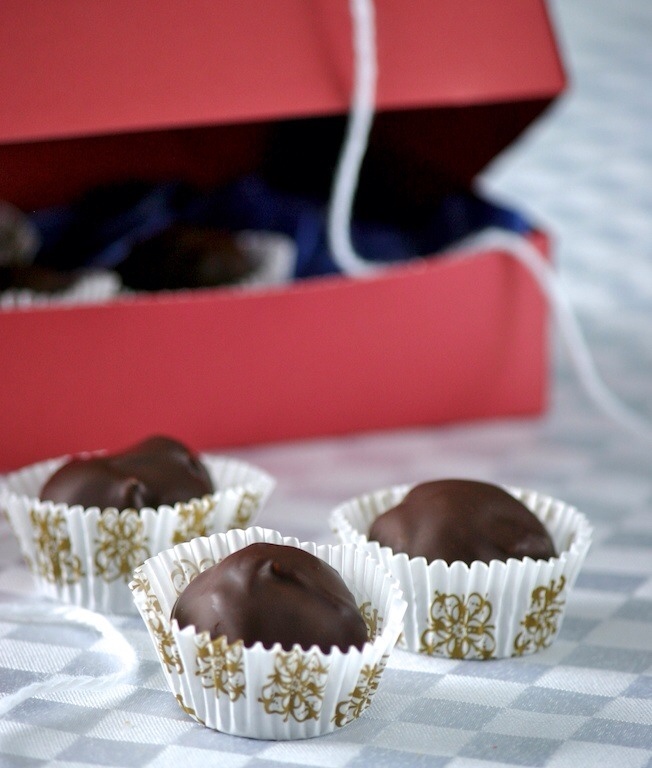 Truffles will keep for approximately one week stored in an airtight container in the refrigerator.